The Rev Dr Gregory Goh Nai Lat (above, chairing the session) began his inaugural President’s Report by thanking the Chinese Annual Conference (CAC), gathered at its 42nd Session at Foochow Methodist Church from 13-16 Nov 2017, for its support and encouragement in his first year of adjusting to his new role as CAC President. Said the Rev Dr Goh: “In the days ahead, we will deal with many reports and decisions. Let us not forget the reason we do all these: To bring people into the kingdom of heaven. We should not just be focusing on being a better organisation.” He offered the following questions for reflection: What is the link to evangelism for every ministry? How can we make adjustments so we can better execute the Lord’s Great Commission for us? A milestone move for the CAC in this Session was the setting up of a fourth district. 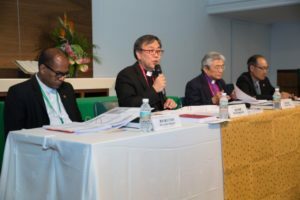 “Connectionalism is important to the Methodist Church,” explained the Rev Dr Goh. One way this is expressed is through the conducting of local conferences by district superintendents. “The District Superintendent is key to the connection between the Annual Conference and the local churches. Our district superintendents are not full-time but have their own congregations to lead and pastor, hence a smaller district will enable them to better execute their duties, so as to promote cooperation, learning, and complementary functions among the local churches.” In this way, the President hoped to encourage churches to work together. A recurrent concern is the renewal of ordained ministers, particularly with more pastors facing retirement soon. Training and development for pastors should also be given sufficient attention, said the Rev Dr Goh, pointing out rapid changes in society and the emphasis laid by the Government on self-development and improvement through awarding SkillsFuture credits. 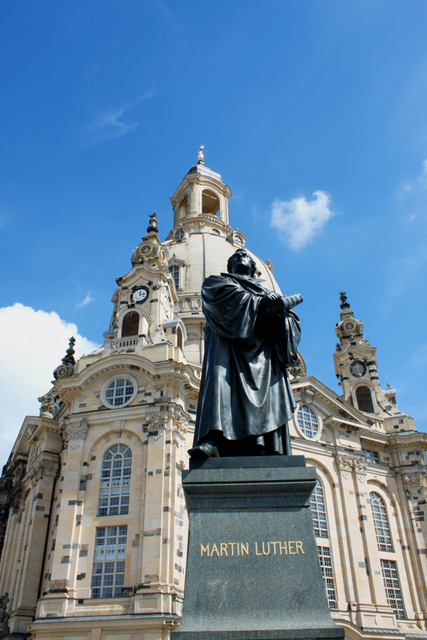 He also noted that joining the pastoral ministry should not be seen as a ‘second-choice career’, or a ‘back-up plan’. “Send your best children to be pastors!” he urged. He thanked God for the ordinands joining the ministry, and congratulated the Rev Dr Edwin Tay on his appointment as Vice-Principal of Trinity Theological College from January 2018. 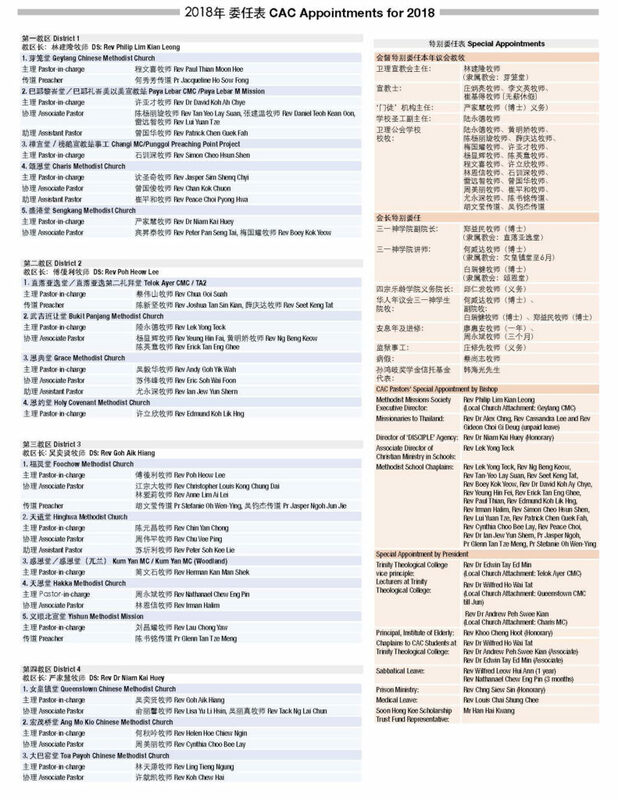 He also mentioned the CAC’s official visit to churches and a Bible school in Guizhou, China, which he had earlier detailed in his Opening Service sermon, highlighting how British Methodist Samuel Pollard had made an indelible mark on the community there even in the deep forests, where he devised the script for the indigenous Miao language (which was instrumental in the translation of Bible texts for other minorities), and established schools and medical services. “Within a span of 10 years, he changed the lives of the Miao people,” shared the Rev Dr Goh. At the Closing Service, the Rev Lui Yuan Tze, the Rev Eric Soh Wai Foon, and the Rev Lau Chong Yaw were ordained as Elders. Pastor Cynthia Choo Bee Lay was ordained as Deacon. 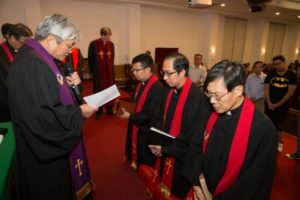 The ordination of (from left) the Rev Lau Chong Yaw, the Rev Eric Soh, and the Rev Lui Yuan Tze. 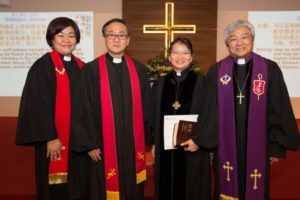 The Rev Cynthia Choo (second from right) after her ordination as Deacon. Retiring pastors the Rev Daniel Lee Kuan Yong (second from left), and the Rev Wong Yeow Lin (second from right). 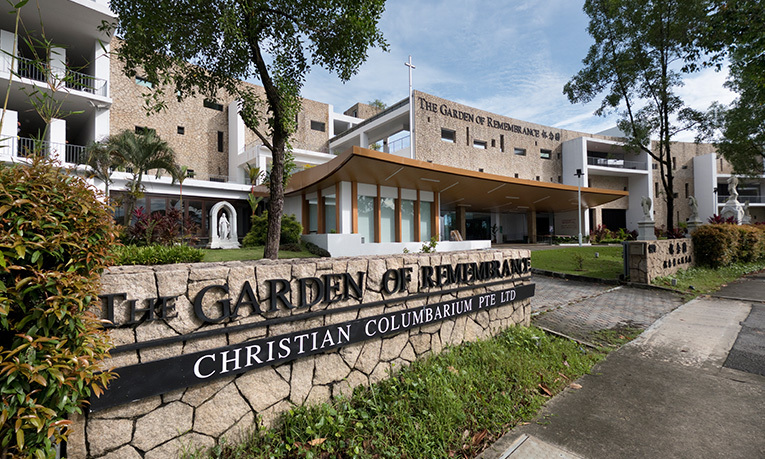 Before the reading of appointments for 2018 (refer to appointments listing), the CAC President spoke about the pastoral appointment system as part of the connectional Church. “I’ve seen how God uses this connectional system to grow the Church and extend His kingdom,” he said. 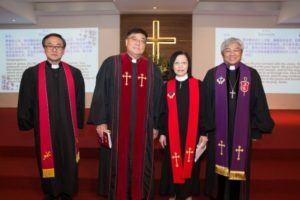 The CAC’s four District Superintendents in 2018 are: The Rev Philip Lim Kian Leong (District 1), the Rev Poh Heow Lee (District 2), the Rev Goh Aik Hiang (District 3), and the Rev Dr Niam Kai Huey (District 4). 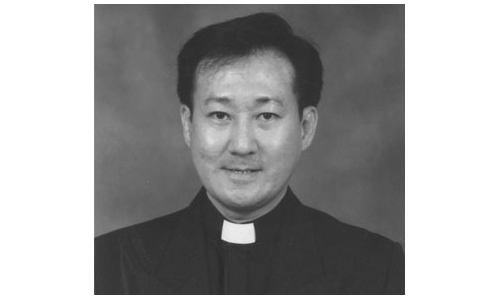 The Rev Dr Goh also announced the passing away of the Rev Dr Yap Kim Hao, the first elected Asian Bishop of the Methodist Church in Malaysia and Singapore, that very morning (see inset article for TRAC). 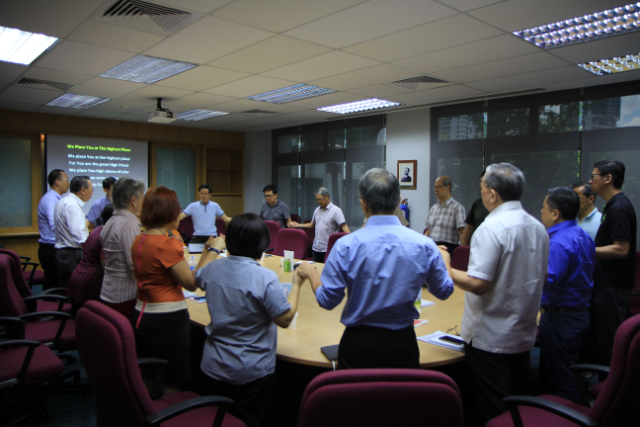 Bishop Dr Chong Chin Chung led in a prayer for the late Rev Dr Yap’s family.